I am leaving the history out and only addressing the possibility of its occurrence. A decent history of this idea is found at wikipedia , and I encourage you not only to read it but to contribute to wikipedia financially, as I do. The idea is that everyone will receive an allowance called basic income from the state. This might replace all welfare payments or it might supplement them. Much of the existing bureaucracy and administration would be simplified, which would reduce total costs. There are arguments in support of this but I found none that address the concerns of those who are not converted to the idea. 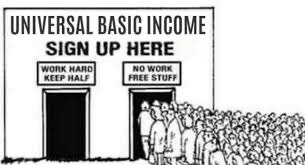 You can consider basic income as a negative income tax, reducing as other forms of income rise; whether this is the same as UBI depends on implementation. We have a variety of situations in which people choose to work for financial gain, while others expect such rewards and returns to be collected in other forms. One viewpoint describes the basic income as a citizen’s return on publicly owned assets. See . 1. One is Alaska, called the Permanent Fund; it passes around $1000 per year to residents of Alaska. I see this as a dividend for choosing to live there and would argue it is not an example of basic income as other perceive it. 2. Another scheme is in Brazil, called the Bolsa Familia. This is an anti-poverty scheme that applies to around 26% of the population. This seems to be effective, particularly in stimulating education and social mobility. 3. Finland is trialling this , giving around £500 per month for two years to 2000 (random) unemployed people. The Finns say this is not UBI but explores whether an unconditional income might incentivise people to take up paid work. 5. See  for a web page that I think will be updated with the current position. If there is no means test then there is no work test . These two are not obviously linked at all, but the extended argument for UBI argues strongly for abolition of the unemployment trap ('I’m better off not working’) and so argues strongly for offering and accepting low-paid jobs which currently do not exist. The general idea is that one would go do things for other reasons, such as social ones. In a sense, because the rewards for work are not financial. People will become lazy, seeing no need for work. This means less tax collected hence less money available from the public purse. The magnitude of this laziness is coupled with the size of the basic income. In the same way, this ‘free’ income is (seen as) a disincentive to employment. 7. no viable way to finance basic income in Germany was found. For me, some of these are problems to choose to solve (2 ,3 ,6, 7) . Given the thrashing that Brexit is generating, the migration issue in point 4 might be solvable in Britain, but any country is made enormously attractive if it runs a basic income scheme, even if there was to be an extended residence delay before one became eligible. For Germany, and hence any other country, the whole scheme is unworkable without effective border control. I also wondered about paying this to children, perhaps in return for taking education. I see this as far too much incentive to increase the population. I see this as applying to children only in the special cases where adult support has been lost. We cannot have situations which encourage further population expansion. I wonder if there would be extended consequences for things like pensions, with arguments against having them at all? The discussion I found  seemed to say that UBI would simply replace the state pension. Well, there’s a load of funding found immediately. Being freed from wage slavery gives society time to adapt to the changes brought about by automation and frees up time for social change and leisure activities. An anticipated change is that many will improve their education (and stimulate that part of the economy). One might hope that the same would apply to health. Dramatic reductions in work-related illness and a reduction in poverty will, it is thought, make a dramatic change to the costs of treating poverty-related illnesses and stress-related illnesses. I disagree, but I’ve read many, perhaps all, of the Honorverse ¹ novels, in which dolists are paid Basic Income and in consequence are, for the most part, sheep. ¹ Honorverse, a long series of books by David Weber centred around the character Honor Harrington. Depending how you decide to count what is included, there may be two dozen books. The overlapping between may become an irritant, but is often not.